Located along the northern coastline of Martha’s Vineyard, Oak Bluffs offers access to some of the island’s most coveted beaches and neighborhoods. 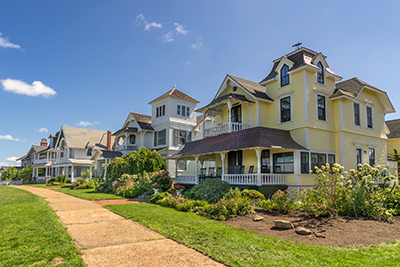 As a compliment to the beautiful landscape, the real estate in this area is iconic; Oak Bluffs’ romantic Victorian homes and gingerbread beach cottages have been a local favorite for over a century. Oak Bluffs’ close proximity to the Massachusetts’ mainland (about 10 miles) makes it easily accessible by ferry or private boat. The ferry ride from Woods Hole in Falmouth, MA, takes less than an hour, and the trip from Hyannis, MA, takes about 90 mins. If you’re thinking of flying to Martha’s Vineyard, the local airport is about 15 minutes from Oak Bluffs, on the border of West Tisbury and Edgartown. The town center of Oak Bluffs is a vibrant community consisting of residential homes, fishing piers, shops and restaurants. In addition to the excellent eateries and shopping, downtown Oak Bluffs is famous for its Flying Horses carousel, the historic Cottage Museum, and the lovely Ocean Park and gazebo. 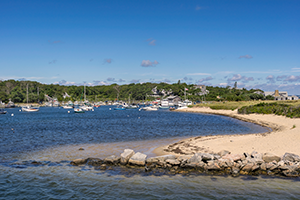 The neighborhood of East Chop is one of the most popular areas on Martha’s Vineyard. This section of lovely residential homes and beaches covers the tip of a peninsula that extends out into Vineyard Sound and Vineyard Haven. There are two beautiful public beaches on East Chop: Eastville Beach and Jetty Beach. This neighborhood is also home to a private yacht and beach club, East Chop Beach Club, as well as the East Chop Lighthouse, a well-known tourist destination. Harthhaven was settled first settled by William Hart in 1873 and has been a popular residential area of Martha’s Vineyard ever since. The Harthaven community is tight-knit, united by a passion for the island and its coastal traditions. This neighborhood is especially popular with members of the nearby Farm Neck Golf Club, which has been repeatedly ranked as one of the best golf courses in the United States. Harthhaven is also very close to the beautiful Joseph Sylvia State Beach, which is just over the town border in Edgartown.